Joe Beribak was born and makes his home in Elgin, IL. 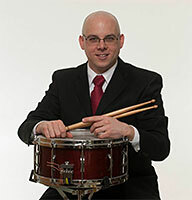 In addition to teaching at MCC, he is the assistant director of the Elgin Youth Symphony Percussion Ensemble and a teacher at Music Matters School in Batavia. Joe focuses on helping students of all ages reach their potential as musicians. He believes that everyone has a unique voice and that studying percussion can help a person discover that voice. Joe received his Bachelor of Music in 2009 from DePaul University. From 2009 to 2013, he received a full scholarship to attend The Colburn Conservatory in Los Angeles, where he studied with Jack Van Geem and earned an Artist's Diploma. He is an avid supporter of contemporary music, having performed with Red Fish Blue Fish, Los Angeles Percussion Quartet, Anaphora Ensemble, and Chicago Composers Orchestra. While in Los Angeles he co-founded The Smoke & Mirrors Ensemble, which premiered works by Derek Tywoniuk, Robert Honstein, and Diego Schissi. Schissi's work Juego de Relojes (Game of Clocks) was recorded on the group's second album, Vanish. Joe's own works have been performed by Smoke & Mirrors Ensemble, Elgin Youth Symphony Percussion Ensemble, and trombonist Evan Spacht.